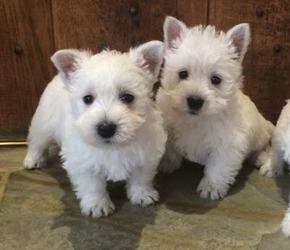 Here we have two beautiful West Highland Terrier pups, have one boy and a girl. All are very playful and friendly. They would make brilliant companions for anyone. The parents are family pet and can be seen. All have been microchipped and vaccinated and are ready to find their forever homes. Lovely litter puppies .Home reared with constant care and attention .They have now grown into playful little rascals and are ready for their new homes . These pups are super fun and make ideal family pets. Amazing personalities.